Sweet potatoes are in season, and they’re a great way to add flavor and heartiness to any meal. You don’t have to relegate them to a side dish; they can be the star of your meal. They’re also good for you—they’re packed with vitamin A, fiber and potassium. Research shows they may reduce insulin resistance in people with diabetes, and they may help lower blood pressure. Sweet potatoes are rich in beta carotene, which may protect against prostate and colon cancers. Ever tried sweet potato nachos? Stop in to The OFFICE Tavern Grill in Morristown NJ to enjoy a plate of this award winning appetizer. 40NORTH Corporate Chef Kevin Felice starts by thinly slicing sweet potatoes and giving them a quick dip in the fryer. Next he tops them with our slow braised pulled pork, apple butter BBQ sauce, Wisconsin cheddar cheese, crisped onions and a drizzle of sour cream. Sweet potatoes are the highlight of this healthy, vegetarian burger. Made with chopped onions, oats, and cumin, this recipe is guaranteed to be a hit at dinner or lunch. This vegetarian soup has a nice blend of peanut butter, green chiles and sweet potatoes. And it’s quick to make—total prep time is just 30 minutes. You can garnish it with chopped peanuts and scallions for extra texture and flavor. In this sweet and savory recipe, roasted sweet potatoes and onions are tossed with arugula and vinaigrette. 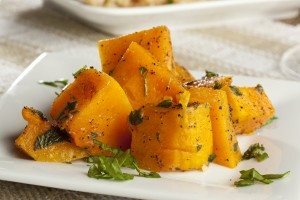 The sweet potatoes are roasted with thyme, olive oil and salt, and the onions are baked with olive oil, vinegar, honey and molasses. Prep time is just 25 minutes. This healthy twist on burritos involves pureeing sweet potatoes with black beans, cilantro, lemon juice and salt, mixing them with onions and spices, then baking them in tortillas. Each delicious tortilla is low in fat and high in protein.